Host Celia Owens is fluent in Italian and will be our liaison on where to go and what to do in Alvito and the surrounding area. Celia will also offer art classes, and we will provide you with an artist sketchbook to use to journal, and to participate in her classes. Ashley Davis is a well-traveled yogi and adventurer, here to assist with your yoga and meditation practice, and to help you have as much fun as possible. 8 Nights will include a variety of local attractions and cuisine, along with planned excursions for you to see more of the beautiful country of Italy, while you stay in a bohemian Italian villa. This is likely to be the closest you will get to what it is like to live in Italy. Immerse yourself in the culture and transport yourself in time. Of course, we will pack more into a week than usual, but the experiences and the household living will be natural to local living. The Val di Comino is comprised of several villages, each with a unique character, and Alvito among them. Local events, such as concerts, food festivals, or films on the piazza may overtake the planned itinerary. SIGN UP NOW! $500 DEPOSIT HOLDS YOUR SPOT. ALL Itinerary & Italian Wellness Details Below! *Please note that all activities are included in the retreat are optional for attendance. Please make this retreat exactly what you want it to be for you, with Ashley & Celia as your hosts! Daily Morning Yoga & Meditation Classes - Lead by both Ashley Davis & Celia Owens. These classes will be tailored for guest experience level. Beginners to advanced will have be able to participate in all classes. Day Trip to Gneo Fonteo Beach & Umbrella Rental - We will travel as a group, and will have everything ready to go for you to spend a relaxing day at the beach! Day trip to Rome - We will travel to Rome together, but once you get there you decide what you want to do. Rome is a big city & many people would like to explore something different. We will have a drop-off & pick-up spot, and you will have the whole day to explore Rome! 3 Qi Gong Classes - Taught By Celia Owens Qi Gong is a gentle form of exercise composed of movements to stretch, meditate, and relax the body and mind. Travel oriented Art Classes - (Sketch & Pencils Book Provided) Celia Owens is a talented artist and art teacher, and will lead a couple of art classes to help you begin your sketch documentation of your travels in beautiful Italy! Daily Breakfasts - 8 breakfasts total with offer an array of morning goodness... please let us know if you have any dietary restrictions. Arrival & Departure Dinner - We will have a welcome dinner & a send-off dinner with our group. These will be authentic Italian meals that we will eat family style at the villa, only non-alcoholic beverages will be served, but you are more than welcome to get wine or other beverage from a local store in town. Refreshments & Lite Snacks - Each afternoon at the villa we will have lite snacks for you to recharge for the rest of your day. There will be a variety to choose from but to give you an idea; fruits, nuts, small sandwiches, cheese, antipasto, etc. Tea & Coffee will be available for you all day. Authentic Italian Cooking Class - One afternoon we will invite a local chef in to teach us some authentic Italian cooking! Transportation To & From the Airport - FCO - Fiumicino Airport Transportation to & from FCO Airport only will be included in the cost of your stay, if you are arriving and departing on designated days. Designated Arrival Days: July 20/21 - Designated Departure Day: July 29/30 - 2018 Flight is NOT included in the cost of the Italian Wellness Holiday. There are a number of adventures for you to explore on your own, including hiking trails, shops, market days, the Italian countryside & more! This is your opportunity to experience living in Italy, with likeminded people in a community that nurtures culture and relaxation. If you choose to eat at the villa for Lunch or Dinner, you are more than welcome to cook for yourself in the Villa’s kitchen. The house itself has 4 terraces, to take in views of the mountains, and the pass to Cassino, where allied forces were held up for 2 years in WWII. Fields of sheep, vines and olives spread out below, and there are a couple of good local commercial vineyards. Lounging on the couches with a good book, working on your sketchbook, cooking up something from the market in the kitchen, or investigating the cantinas with old farm implements, hand-blown wine bottles the size of a beach ball, and a cave where people hid from the occupiers during WWII. There is a garden and rooms called cantinas, where work was done such as bottling wine and making cider, and small animals like rabbits and chicken were kept. One of the cantinas has an old fireplace and pizza oven. A thriller film called La Coicciara (called Two Women in the USA) starring Sophia Loren, was filmed in this area, known as Ciocciaria (pronounced cho-cha-reah) during the war. The main apartment has a living room, dining room, kitchen, library with television & reading table. Most of the windows are full-length French double doors with shutters that shield from the sun during the day. This floor will be the congregating area. All rooms have shutters that shield from the sun, but that also allow the breeze in. There is also a washer and a terrace for hanging clothes. The cost next to each room is the cost for the retreat activities (listed above) & accomodations. (Flights are not included.) A $500 non-refundable deposit will hold your reservation, which is applied to the total cost of your Italian Wellness Holiday. *If you are needing an extra night added to your accomodations, your room is available 2 days prior/after the holiday for $50/per night, per person. Val Di Comino Room (Master Suite) - BOOKED! *The itinerary is subject to change, due to any unforeseen circumstances. Please note that the itinerary is offering ideas of things for you to do, but you can choose your schedule and activities any way that you would like too. Saturday 7/21 -- Airport Transport to Alvito; settle into your rooms; all day snacks and light supper; orientation to the town with maps provided; we will start getting to know each other. 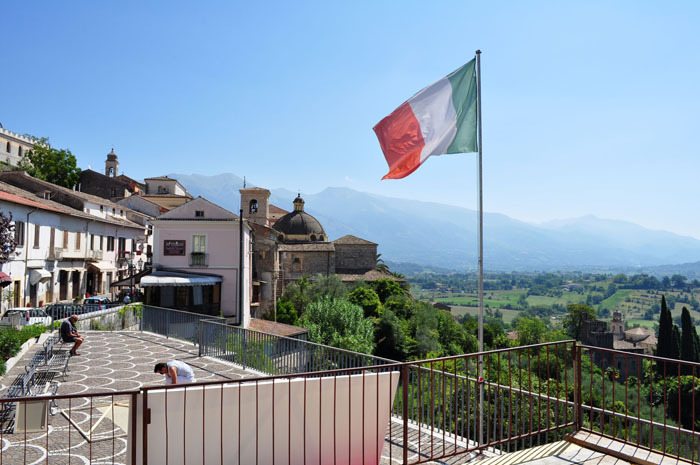 Sunday 7/22 – breakfast; restorative yoga; suggested day trip to Casa Lawrence Agriturismo in Piscinisco, for long leisurely multi-course lunch and lying on the grass; return (with a stop in San Donato for a look around? ); back home light fare available, and unplanned explorations; Celia will introduce sketchbook/journaling. Monday 7/23 – EXCURSION DAY - Cornetti and coffee, early start to Gneo Fonteo Beach Club; morning swim, lunch (not expensive, but not included; also lounges and umbrellas can be rented for E10-15 per day – very worth it, especially at this narrow beach), sunbathing, showers; 3 pm departure for coffee in Sperlonga, or touring Grotto di Tiberius; 1 hour drive home to hang around the house or enjoy an evening out. Tuesday 7/24 – breakfast; early hike to the castle with our sketchbooks, where Celia will lead in landscape drawing, details and writing, and Qi Gong at the edge of a mountain, lunch together at the restaurant (we will reserve a table for the people interested in going, lunch is not included) rest on the grass, explore the Castello district of Alvito; hike back down taking all the time you want to get lost, sketch, photograph, have an aperativo, sit in a piazza, etc; stargazing & meditation. Wednesday 7/25 – EXCURSION DAY Early public bus to Rome; return bus will arrive in Sora and we will arrange private transport from there to Alvito; late night snack available. Transportation cost to and from Rome included. Thursday 7/26 – Early public bus to Sora Market, with private taxi bus back to Alvito around noon – bring shopping bags; make lunch together with what we get at the market, eat and rest; afternoon drawing people lesson and qi gong; evening to meet Italian friends invited over for pizza ordered out. Cost of taxi and food not included. Friday 7/27 – breakfast; therapeutic walking from the house down country lanes past olive groves and back home; rest; greatest yoga class ever; snacks available or go out and find lunch but take it easy because we will have a great dinner at Sale e Pepe at 8 pm. Saturday 7/28 – breakfast; Alvito Market; make lunch together at home; free afternoon to pack; finale yoga; catered dinner at home together; more stargazing & closing ceremony. Anyone who wants to arrive or depart in a way other than what we are arranging is welcome to consult with us about your options to and from Alvito. However, transportation is only included if you choose to arrive/depart on designated travel days. Make your deposit today to register for the Italian Wellness Holiday.